I am THRILLED to share the latest collaboration between Dave and me. 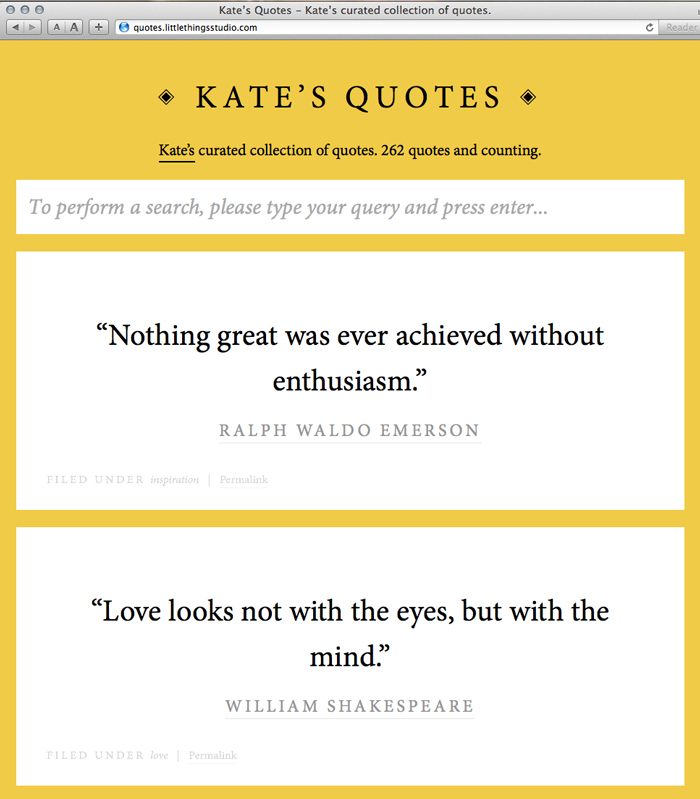 After being asked countless times “Where do you get all your qoutes?” I finally have a good answer –> ON MY OWN QUOTES WEBSITE! Dave actually was actually the one that suggested a website for just my quotes. I feel like this could become something much bigger. Have you ever googled “quotes?” I have. A lot! Almost all the websites look like they were “designed” (if you can call it that!) back in 2002. Well, it’s 2012, folks. It’s time for responsive websites and curation. ENOUGH WITH THE TWILIGHT QUOTES ON GOOD READS! I can’t tell you how proud and excited I am about this. I realize I am *very* lucky to be dating a brilliant web designer who can build me all these fabulous things. Otherwise, my collection of quotes is sitting in about 8 different mislabeled files under the folder “Quotes.” So you are getting the best of the best on this site. I use all these quotes for my prints, journals, bookmarks, greeting cards, etc. You can tweet, pin, facebook, whatever it is you do, do that to your hearts content. I don’t own these. I have just collected my favorites. Someone asked me “aren’t you afraid of someone stealing your idea?” NO! You could have been doing the exact same thing I did, googled quotes, made some patterns, print them out and put them up on etsy! But you didn’t! And if you do, your quotes, style, colors will be different from mine. That is a beautiful thing. This is great news! I’ve been searching for quotes to use for my Inspired Designs (http://foxmeadowcreative.com/design/blog) and it is a pain sifting through all those lame quote sites. Thanks so much for sharing! And great job on the site, Dave.